After 8 a.m. on October 4 at the Central Hospital in Yogi, Naha, patients in wheelchairs got into a car to transfer to an evacuation shelter. Around 10 a.m. on October 4, at a construction site for an accommodation facility in Yogi, Naha, Ground Self-Defense Force personnel disposed of an unexploded WWII five-inch shell (44 centimeters long and 12.7 centimeters in diameter). The unexploded ordnance was found this August. The disposal work was completed at 10:31 a.m. and no damage occurred. About 1,710 people were evacuated from about 610 households and 74 business premises within a 156 meter radius of the site of the disposal. 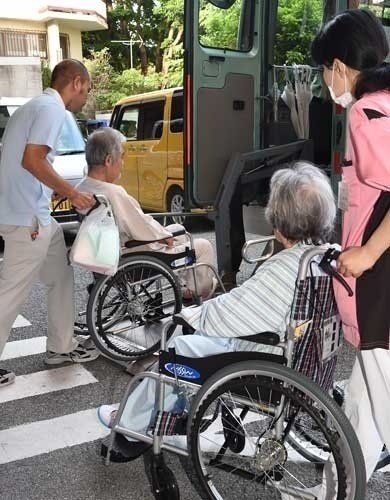 Fifty-seven people evacuated from Naha City Public Health Center. From 9:50 a.m., traffic control was implemented at 14 locations, including a partial closure of Route 222, which meant buses had to take a detour. The areas evacuated included hospitals and elderly residences. With help from staff, residents and patients evacuated to a shelter and buildings away from any potential danger. 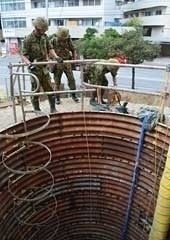 On October 4 at the site of the unexploded ordnance disposal in Yogi, Naha, Self-Defense Force personnel prepare for the work at a disposal bunker.